A not necessarily neatly stitched together blockbuster collage, The Mummy: Tomb of the Dragon Emperor might be termed supernatural romantic action adventure retro-epic horror fantasy noir. In effect, this overly accessorized failed tribute to the Mummy classic, like its main character in question, arrives essentially DOA and without benefit of effective cinematic CPR, despite all the post-WWII noisy cat-and-mouse chase carnage and bloated battlefield beatdown clutter. Brendan Fraser, in his second scary descent underground in less than a month following Journey To The Center Of The Earth, turns up in this Mummy occult travelogue as retired itinerant occasional explorer and full time party hard swell, Rick O’Connell. Rick and his UK writer’s block novelist spouse Evelyn (Maria Bello) are summoned back to duty when they receive word that their danger junkie archaeologist chip-off-the-old block son Alex (Luke Ford), is stranded somewhere in remote China dodging an evil mummified ancient emperor returned to life. 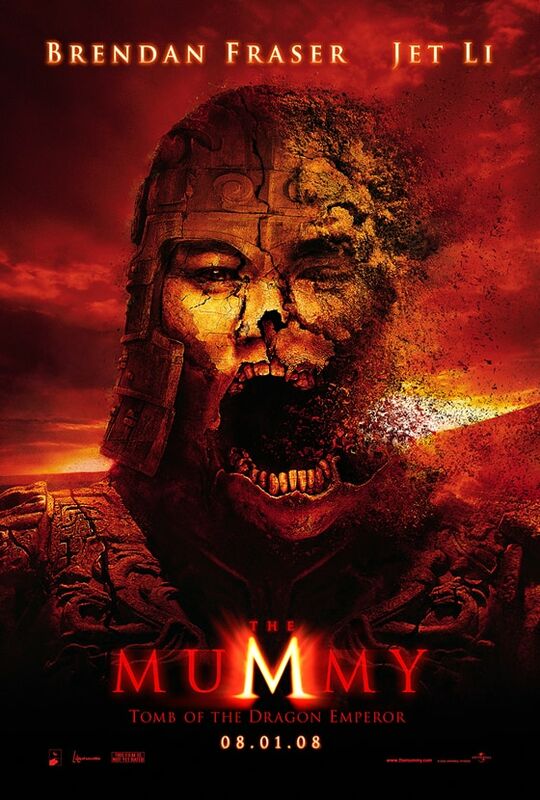 Playing fast and loose with history as well as established mummy protocol, director Rob Cohen (The Fast And The Furious) primes Jet Li as the weird karate kicking living dead royal loon, in apparent cahoots with a faction of the Chinese army. That all this subversive national intrigue is taking place on the eve of the Chinese Revolution, seems to be a point about which Cohen is pretty much clueless. Equally on literally shaky ground following his resurfacing from below, is that perpetually shape-shifting mummy king. Possibly suffering from multiple personality disorder as well as a whole menu of psycho-pathologies, he’s variously a three headed dragon and a hairy beast. Though running interference on the Shangri-La bound demon out of the blue, is a mysterious gang of ready to rumble Himalayan abominable snowmen, along with really angry disintegrating skeletons with swords rising up out of the Great Wall, all of whom take sides with the endangered humans. Also on hand for a little prehistoric Sanskrit hocus pocus, is the resident equally ageless witch played by Michelle Yeoh. Not exactly mummy dearest, the movie does have a supply of magical surreal moments of stylish sorcery in store. It’s just that if you’re not into an overload of mixed metaphors and are a bit of a purist about archaeological flights of fancy, you’re not likely to, well, dig it.